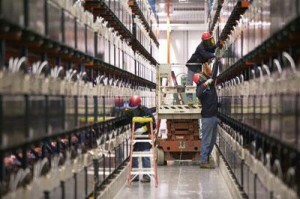 The city of Fairbanks, Alaska connected to what was at the time the world’s largest battery backup. Designed to help prevent serious blackouts that plagued the city every two to three years, the batteries could provide power to the city for a few minutes – enough time to start up the city’s backup diesel generators. The battery contains 13,760 cells covering more than 10,000 square feet. It was reported that in the first two years of operation, the battery system prevented at least 81 power failures.